Anyone who’s a fan of reggae music will know all about Horace Andy, but his musical pedigree stretches far beyond that. 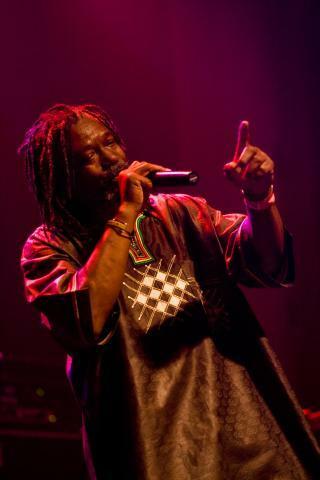 Horace Andy is a Jamaican singer-songwriter known as the sweetest voice in reggae, and for his long association with British trip-hop band Massive Attack. He was born as Horace Hinds on 19 February 1951 in Kingston and is also known as "Sleepy". He became an enduring voice on the Jamaican music scene in the early 1970’s. His signature hit ’Skylarking’ defined his ability to deliver songs of black determination and social commentary, topping the Jamaican charts in 1972. More hits followed, initially working with Coxsone Dodd at the legendary Studio One, producing tunes like ‘See A Man's Face’ and the well-received ‘Mr. Bassie’, then later in the 70’s working with Bunny ‘Striker’ Lee producing the well-received ‘Just Say Who’, ‘You Are My Angel’, ‘I've Got to Get Away’, and ‘Money Money’, among others. Andy has consistently recorded and performed around the world in his own right with his band and has remained massive in reggae subgenres roots reggae, rocksteady, lover's rock and dancehall. After relocating to London in 1985, Andy was discovered by the Bristol-based trip-hop band Massive Attack, who cited Andy's work as a major influence. He recorded the song "One Love" for their 1991 debut album, Blue Lines, and the band's popularity exposed Andy to a younger generation of fans, many of whom continue to seek out his earlier work. After Massive Attack launched their own label, Melankolic, they released Skylarking, a compilation of Andy's career hits, collected from a career spanning well over 30 albums and numerous singles. Andy is the only singer of Massive Attack's rotating group of guest artists to appear on each one of the band's albums. Other Massive Attack tracks featuring Andy include ‘Spying Glass’, ‘Angel’, and a reworking of his own track ‘Girl I Love You’ on their most recent LP ‘Heligoland’. He continues to tour worldwide with Massive Attack, and will be appearing with them across Europe at festivals early this summer. “It was good timing for us as Horace had a gap in his schedule following the Massive Attack dates”, said Vale Earth Fair Collective member Rob Roussel. “We’ve wanted to put on some proper roots reggae at the Vale Earth Fair for a long time, and Horace Andy certainly fits the bill – it’s going to be a special night”. “He’s been a long-time favourite of mine, so personally I’m really excited to see him play in the Vale Castle”. There are still a few gaps in the line up to fill, but other acts confirmed for this year’s Vale Earth Fair include Imperial Leisure, who’s music is described as a fun-loving throwback to the ska-2-tone era combined with more recent punk rock-hip-hop sounds - their gigs are an exhilarating experience from start to end with very little let up in between, and French metal band Transat. Local acts include Tantale and Honest Crooks, and Jersey band The Crack will be hitting the main stage this year. In the meantime the Vale Earth Fair is hosting a stage at the Rocquaine Ragatta barbecue on the 4th August from 5pm. Advance tickets for the Vale Earth Fair, which takes place at the Vale Castle on Saturday 25th and Sunday 26th August, are on sale now here .